In 2011, when Barack Obama had to approve the raid that would kill Osama bin Laden, he didn’t decide quickly. Instead, he chose to sleep on it first. After taking 16 hours to reach his decision, he got a lot of criticism. As a business leader, often you’re faced with complex, high-impact situations that call for big decisions. Should you make these immediately? Or like Obama, should you give yourself time to weigh up all the options? Research suggests that time (and sleep and meditation) can help you make better business decisions, even tapping into your creative side. After a bad night’s sleep, have you ever battled to make what should be a relatively easy decision? Studies show that you make better decisions after a good night of sleep. To make matters worse, lack of sleep is linked to difficulty making good decisions. In one study published in the journal Sleep, researchers found that sleepiness seriously impairs the capacity to make effective decisions. Another study suggested that sleep hampers decision-making when gambling by increasing expectations of potential gains while reducing expectations of losses. Even if you do get enough sleep, the simple act of “sleeping on a problem” can improve your decision-making. How? According to conventional thinking, it clears our heads and takes away the immediacy (and stress) of reaching a decision. Sleep also helps organise our memories, process the day’s information, and solve issues. However, according to research led by Maarten Bos of Radboud University, the Netherlands, ‘clear’ thinking can sometimes compound the problem. Why? Because clearheaded, rational, conscious thought makes us more certain about our decisions, even when these are incorrect. For intricate decisions where you have some expertise, “sleeping on it” may be more valuable than staying awake for hours consciously thinking about it. Sometimes when we consciously deliberate over a decision, we get so engrossed in the details that we cannot see the bigger picture. Sleeping on a decision enables us to separate the important information from the irrelevant “stuff”. This, together with your subconscious mind’s power to process big decisions complicated by many variables, results in higher quality decisions. The brain makes effective unconscious decisions, when we give it the time – by sleeping long enough. So, if you’re facing a big decision, in their Harvard Business Review article, Bos and co-author Amy Cuddy of Harvard Business School recommend a three-pronged approach: take in all the information, sleep on it and then check the facts again. And if you don’t have the time to sleep for a solid eight hours before making a complex decision, try listening to music, or running or, for that matter, any task that takes your mind off the decision. This will put your conscious mind on the backburner, so your subconscious can do its job. 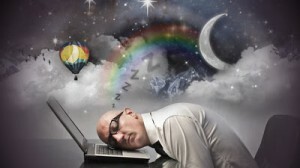 On top of sleep’s positive effects on decision-making, getting enough sleep also boosts your creativity. Artists have long hinted at a link between creativity and sleep, but scientists are now starting to understand the relationship. Based on recent studies, the rapid-eye-movement (REM) stage of sleep when dreaming helps sort and link in new ways the facts we know and the things we experience. “Creativity is the ability to connect disparate ideas in new and useful ways,” says Sara Mednick, PhD, assistant professor in the University of California’s psychiatry department. Mednick’s research found that REM sleep may improve creative problem-solving by helping the brain associate apparently unrelated concepts. New evidence reveals that meditation can improve business decisions and stop your company making costly investment mistakes. Meditation is becoming more and more popular with the C-suite. With executives like Rupert Murdoch of News Corp, Bill Ford (of Ford), Rick Goings of Tupperware, and Marc Benioff of Salesforce.com all plugging its benefits, executive coaches are starting to incorporate meditation into their programmes. The aim is to still the mind’s “chatter”, improve focus and cope with stress. New evidence shows it is more than just a “feel good” exercise: just 15 minutes of meditation can help you make more effective, more profitable decisions. How? By boosting resistance to the “sunk cost bias”. What is the sunk cost bias? This basic rule of economics says we should not consider irrecoverable or “sunk” costs when making decisions about present or future investments. In simple terms, you shouldn’t throw good money after bad. A classic example is that of the Concorde supersonic jet. The British and French governments continued financing the joint development of Concorde even after it became obvious that the aircraft would be unprofitable. Privately, the British government considered the project a “commercial disaster” that should never have been started, and was almost cancelled. However, in the end political and legal issues had made it impossible for either government to pull the plug. By contrast, a fantastic business decision that avoided the sunk cost bias is this: when Steve Jobs took the helm as Apple’s CEO a second time in 1997, he discontinued many of Apple’s products and led the company to massive profits. “In that situation, Jobs had clear evidence of what wasn’t working in the business, so he changed course,” explain Sandeep Baliga of Kellogg and Jeffrey Ely of Northwestern University. “There may be cases when processing of the past can be useful for making decisions,” she says, “but what our research suggests is that people make better choices in the present moment when letting go of sunk costs is required to make the best decision.” In short, meditation helps business leaders cut their losses and move on. Anger and good decision-making don’t go hand in hand. When you’re faced with a situation that makes your blood boil, and you let that anger erupt into a full-blown rage, it is very difficult to think clearly and rationally. Anger and rage cloud our judgement, making us do and say irrational things that we’ll regret later. Some of our worst decisions are triggered by short-term visceral emotions like anger, lust, worry or greed. So instead of reacting in anger, rather sleep on it. It’s important to put some time and distance between you and whatever is making you angry. Sleep does exactly that. You don’t have to respond immediately. Usually it can wait a day or two until you’ve calmed down and your judgement is less clouded with emotion. Jeff Domansky, who goes by the name of The PR Coach, concurs. In his words: “Reacting too soon, or over-reacting, can accelerate a crisis unnecessarily….try the RSP approach. Ready. Set. Pause. Get the facts. And then use your judgment….” Oscar Pistorius would have done well to take Domansky’s advice. The three time frames give a more long-term perspective on your decisions and help you see the bigger picture. They will also help you explain your decision to all the stakeholders involved, be they your family, your friends, your customers, or your staff. Sleep, the calm it brings, plus meditation and a long-term perspective on time, can help you make better business decisions. Here’s to that elusive eight hours of shut eye!